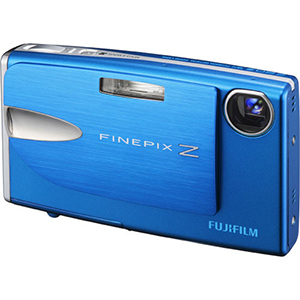 The Fujifilm FinePix Z20fd Digital Camera is an ultra-slim and Stylish camera with a durable all-metal mono-body design and a unique non-extending lens. It features an impressive 10.0 Megapixel resolution, a 3x optical zoom lens, high sensitivity of ISO 1600, and the useful blog mode. The sharp 2.5" scratch resistant LCD screen lets you easily frame and view your images and the intuitive menu system is so easy to navigate, anyone can use this camera. The FinePix Z20fd is loaded with features that will ensure that your pictures look great. The impressive hardware-based Face Detection technology identifies up to ten faces in a frame and optimizes focus and exposure while the Automatic Red Eye Correction feature removes red-eye from your images to provide the best possible people-pictures. A total of 14 special scene position modes (including Portrait, Landscape, Snow, Night and Close-up) make the camera ideally suited to any photo opportunity. In addition, when a still image isn't sufficient, the camera's movie mode captures movie clips with sound that are of broadcast quality, and even provides sophisticated in-camera video control features so you get the exact video clip you want. The FinePix Z20fd is equipped with a fast USB 2.0 interface, or you can use the IrSimple interface for wireless communication with other IrSimple-ready cameras and devices. Plus the camera provides versatility in regard to memory options - being able to record images and video clips to either xD-Picture Card, or Secure Digital media; the camera is even compatible with Secure Digital High Capacity (SDHC) cards so you can use very large capacity memory cards. The FinePix Z20fd produces images with an incredible 10.0 megapixels of resolution, providing incredibly sharp and detailed images even when printed to poster sizes. The FinePix Z20fd features an innovative non-extending, refractive optical zoom lens which provides faster start-up and bring your subject closer to you with a 3.0x optical zoom (equivalent to a 35 - 105mm on a 35mm camera). The camera also has a 5.7x digital zoom that lets you get even closer providing a combined 17.1x total zoom range.